June 23, 2009 - Make sure you like EcoJoes on Facebook to stay updated on green ways to save money and help the environment. Just click the "like" button below. Muchas gracias! 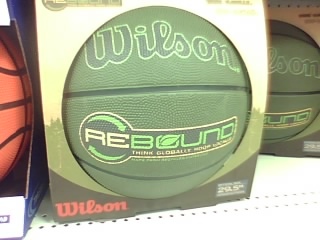 During a recent trip to my friendly, local, down-home neighborhood Walmart, whilst perusing the sports section, what should catch my eye but a fahwnky green basketball. I snapped a precautionary picture before taking my chances and slowly approaching the strange, green orb. I figured it’d be one of those gimmicky “Go Green!” products whose only claim to “greenness” is its actual color. Imagine, if you will, my surprise when I saw that 40% of its surface is made from recycled rubber. Now sure, that’s not 100%, but that’s almost half of the surface that’s made of recycled rubber! Crazy. While it’s not quite as eco-friendly (or cheap) as buying a used basketball (or just finding one in a creek), it’s a good start. I hope to try one out soon; if it passes my reverse jam test, then it’s good enough for me. Posted in green business, recycle	on Tuesday, June 23rd, 2009 at 7:09 PM.